“The adolescent mind is essentially a mind or moratorium, a psychosocial stage between childhood and adulthood, and between the morality learned by the child, and the ethics to be developed by the adult” (Erikson, 1963, p. 245). I began teaching teenagers in 2004 in Texas. I really enjoy teaching teenagers and supporting them in becoming strong individuals ready to conquer the world as adults when they leave my classes. Teaching teenagers is much harder today than when I was a teenager. 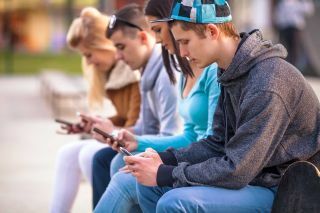 With social media, teens are constantly evaluated by peers and people worldwide. Bullying is a rampant problem and impacts millions of teenagers. according to the famous theorist, Erikson, teenagers are at the 5th Stage of Development, called the Identity vs. Role Confusion (12-18 yrs. old) stage. Teens are developing their identities, focused on fitting in, establishing beliefs, and defining their values and goals. My new book, Hacking Digital Learning Strategies with EdTech Missions, has 10 digital missions to help teachers support their teenage students in establishing their identities and defining their goals using technology and digital devices. Below, find 10 different types of activities and tons of resources to address the developmental needs of your teenage students. One way to help your teenage students set goals for their future is with vision boards and dream boards! Check out resources and lesson ideas here. Get students to reflect on their identities with selfie challenges which is one of the missions in my book. Find selfie activities, resources, and apps here. Find a free Epic Selfie Adventure template here. Students can create selfie comics with the Comics Head (iOS/Android) app, Friendstrip (iOS/Android) app, or selfie comic videos with the Lomics (iOS/Android) app. Teens can create selfie avatar videos with Gabsee (iOS/Android) app. Flipgrid (iOS/Android) app and web tool or VoiceThread (web/iPad) app. Flipgrid is especially motivating for teens with emoji reactions and other cool features. Get your teenage learners to create podcasts, host a radio talk show, or create other audio projects. Find resources and web tools and apps here. Students can learn how to conduct interviews with the lesson plans and questioning tips from StoryCorps. Teens communicate and express themselves with emojis, text speak and emoticons. Bill Nye has a new video series #EmojiScience where students can snap an emoji and receive science videos. Find more emoji resources and activities here. Teens love creating videos. Get them working in small groups to produce animated movies, claymation videos, tv commercials, news reports, documentaries, DIY/How-to videos, tutorials, silent films, and other types of films. Find resources and web tools and apps here. Teens are motivated by game based learning and gamification. Find resources and web tools here. Teenagers love creating playlists and discovering music. Check out these resources for getting students to learn with popular music and hip hop. Students also enjoy memes. Get them to create memes about the rules or to express how various characters feel with Meme Generator. Students can also find several math and science memes as well. Gif Lingua is a website to learn English with Gifs. Get teens to create their own gifs with Giphy, Gif, Gif Paint, or turn Google Slides into Gifs. Challenge: Try one of these ideas to engage learners in your classroom this year!